This article is about the Clone Trooper. For the Imperial Stormtrooper, see Imperial shock trooper. The Shock Trooper is a minifigure from the Star Wars theme, first released in 2007. 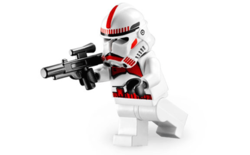 This minifigure depicts a specialised Clone Trooper from the Star Wars universe. 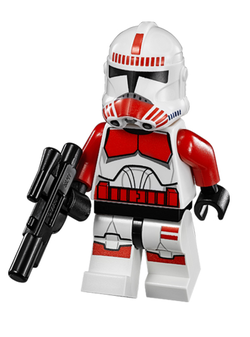 The first variant of this trooper was released in 2007. It has white legs with a black leg joint, and the standard Phase II Clone Trooper printing on the torso piece. The only difference in the torso has red printing, colouring the chest plates and also the belt that is printed on both the front and the back of the torso. As with all Clone Troopers not in The Clone Wars subtheme, this minifigure has a plain black head piece. The helmet is of the standard Phase II mould, however has additional red printing on the sides, below the mouth grille, and several lines above the visor and along the bottom of the piece. A second variant of the trooper was released in 2008 with the 7671 AT-AP Walker. The only difference between this variant and the original is that this minifigure had a completely white leg piece. Both variants came armed with a blaster rifle. Shock Troopers were specialist Clone Troopers within the Coruscant Guard, a unit first led by Commander Fox, but would later be headed by Commander Thire. These troopers were originally tasked with patrolling plazas and guarding government buildings and landing platforms, however as the Clone Wars went on, the Shock Troopers began to take on more of a policing role, with the right to perform random security checks on citizens. At the end of the Clone Wars, Shock Troopers escorted Emperor Palpatine to Mustafar to retrieve Darth Vader's body. This page was last edited on 30 August 2016, at 01:43.